Yesterday was a BWO day if there ever was one. Not your usual Colorado weather (sunny) but cold, overcast, drizzly, windy and rain. The sun tried hard to get through the cloud cover but it never happened. My new friend Phil Echelman and hit the river hoping, in vain, it would warm up at least a little bit. With the wind setting in early afternoon, windchill set in to make things worse. Fishing began a bit slow, I started with a Copperbari and teased a fish to flash but that was it. 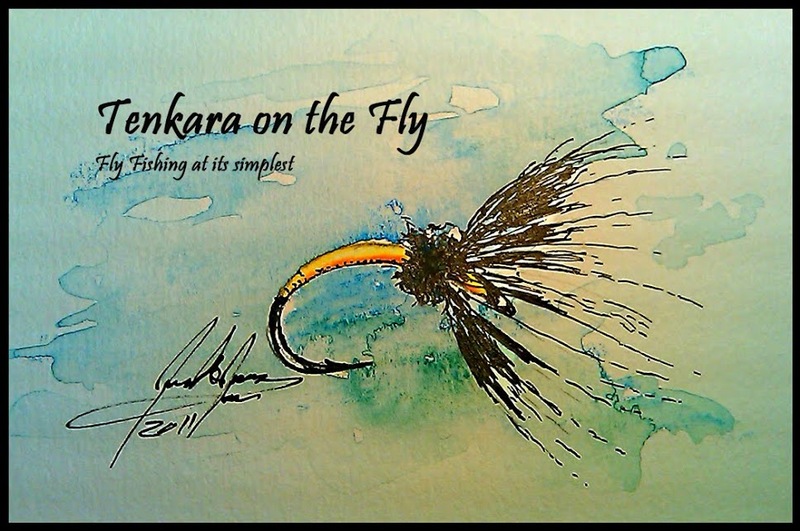 I decided to add my a small purple something from a tenkara fly swap and promptly hooked up with a acrobatic rainbow that I lost to bad know. Since it looked like they were into the small stuff, I tied on my old friend the RS2 as a dropper and things got a bit more interesting, hooking another fish or two. We moved downstream around the bend and started working some interesting looking runs and pockets I knew were holding fish. Remember I mentioned it was BWO kinda day? Bingo, around noon I started seeing noses of some nice fish come up and picking up little sailboat like BWO duns off the surface. I watched a few them floating through the seam just to be picked up leisurely by a trout. I cast my Copperbari into the seem, kept a tight line to drift the kebari as high as possible in the column and promptly hooked up and realized that those were not the same trout I was catching during the Summer in various creeks, those were trout with shoulders from a quality tailwater; well fed and strong. Since the Copperbari was a bit too heavy, I tied on a green kebari tied with thread and some grizzly hackle that I found at the bottom of my fly box. This made it a bit easier to keep it riding on top and the trout surely approved. I hooked and landed a good number of feisty rainbows and brown trout and Phil joined into the action also. But as suddenly as the hatch started, it ended as quickly. The rest of the day left us in search of more trout further downstream, hooking up here and there before the wind and rain had us pack up. I sure was glad having ventured back to the South Platte for some quality trout before "really" cold season. PS: Jason - even you would have lost your South Platte skunk today. I want to even more now! Brian, get yourself our here for a few days next season and I will show you around. Phil - thanks for joining, let's go fish soon again! Awesome day guys! Wish I could have made it. Jason... this would have been the day to get rid of your South Platte skunk. Maybe next time? Karel....nicely done. Those are some beautiful trout! Thanks Chris. That one brown with those big spots was my favorite. It was good to see how those trout were well fed and healthy. The overcast weather made for some great pictures, thanks. Some nice fish despite the challenging conditions! Karel, nice writeup and good fish photos! Hope to be fishing there with you guys soon...still planning. Karel, thank for posting this. I'm leery about the South Platte even though the chances for a monster trout are pretty good. Glad you had a great day.